Grand Canyon Hotel / Hostel is located on Planet Well known Route 66. 62 miles South of the Grand Canyon. 6 individual beds in a co-ed dorm. Private rooms also offered. Owners were warm and friendly and nice. Pleasant to stay. Family warm and friendly for sure. Would definitely consider coming back. Really great service. We were running late and yet the staff helped us out with keys and room late in the evening. The employees is very warm and helpful. Wonderful customer service. 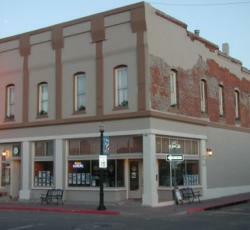 It is located in a cute little town right on Route 66 within walking distance of several cute caf&es and restaurants. It is close enough to the South Rim of the Grand Canyon that the drive felt fine. A very nice hotel, warm and friendly and helpfull staff, very good setting and very good value. This hotel made me desire to cry with happiness. The interior of the hotel looks just as it may have done back within the late Nineteenth century when it was established and every small detail has been accounted for. Each room has a theme and are only delightful, clean and so lovely to come back to right after a huge day of exploring the surrounding area. The employees are super warm and friendly and greet you &'home&' each night and also the extra facilities like the fridge, microwave, kettle and freshly brewed coffee of a morning make for great little extras. I really loved this hotel. Cleaning employees is extremely helpful. Every room has a different style, which makes the Hotel itself an experience. Perfect place to start a trip to the Grand Canyon. Great, friendly staff. Centrally located, clean, properly maintained hostel. There was so much history in the building and so much work has gone into restoring it. I was given a lovely welcome and great tips on where to eat and where to get fuel. Altogether a fun, upbeat, great place to stay and to meet a variety of new and interesting people. It felt like home! The hotel is right in the heart of Williams and it's only an hour and a little bit from the Canyon. I loved this place! The staff are extremely lovely. The hostel is cosy, like a huge home really. Only downfall - could not open the window within the room so was quite hot at night. The town is a magnificent little country town. "Welcome home! " That's what the owner said to me when I returned from a day at the Grand Canyon. Though I was only there for two nights, that was honestly what it felt like. She and her husband (I think) were super friendly and helpful. The room was really cute and clean. (Just be sure to turn the air conditioner if you sleep up on the loft level. ) I would definitely recommend this hotel. and am likely to stay there when I return to the canyon myself. &"Welcome home! &" That&'s what the property owner said to me when I returned from a day at the Grand Canyon. Though I was only there for two nights, that was honestly what it felt like. She and her husband (I think) were super friendly and helpful. The room was really cute and clean. (Just be sure to turn the air conditioner in case you sleep up on the loft level. ) I would definitely suggest this hotel. and am likely to stay there when I return to the canyon myself. * Grand Canyon Hotel rated 4.77 out of 5 based on 13 customer reviews. Hostel reviews with a star rating are sourced from HostelBookers. If you find Grand Canyon Hotel with the same booking conditions at a lower rate somewhere else on the internet after you have booked, we will refund you the total difference.